I just got back from the RWA National conference in Orlando, Florida. Despite the heat and humidity and, well, Disney-ness of it all that seems to have kept away some folks, I had a really good time. I saw many favorite authors and author-friends and participated in the first RWA Blogger Day! If they do that again in the future and you’re a blogger, I highly recommend it. It was so fun to connect with other bloggers. RWA did a great job of making us feel welcome with special meet and greets and extra books for all (which you know is the best part of the conference). I picked up a few things for myself, but I mainly focused on finding fun goodies for you guys, my readers! So now I’m doing a giveaway. 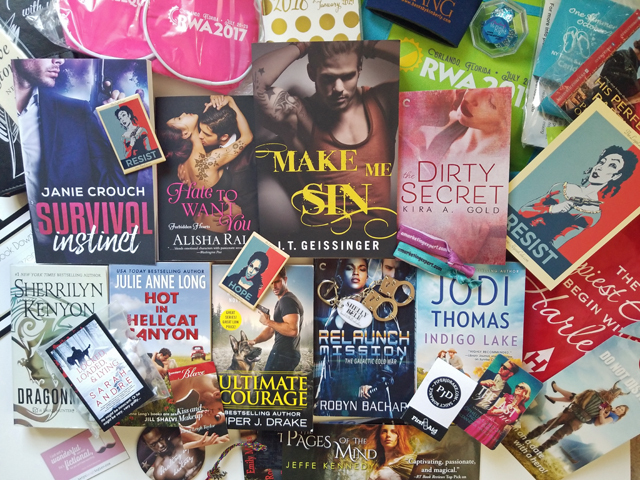 One lucky reader will receive an RWA official conference tote with all of the following paperback books: Survival Instinct by Janie Crouch, Hate To Want You by Alisha Rai, Make Me Sin by J.T. Geissinger (RITA-nominated), The Dirty Secret by Kira Gold (RITA-nominated), Indigo Lake by Jodi Thomas, Relaunch Mission by Robin Bachar, Ultimate Courage by Piper Drake, Hot in Hellcat Canyon by Julie Anne Long (RITA-nominated), Dragonmark by Sherrilyn Kenyon. Plus a few download codes for free ebooks, bath bombs, an Alyssa Cole purse mirror, magnets, mini first aid kit, hair ties, drink cozies, 2017-2018 agenda, blank journal for planning or writing, bookmarks for all your many books and MORE. Everything you’ll win is pictured up above. Plus I’ll go through my stash of cool author promo stuff from other recent events and throw in a few more surprise goodies too. If you like book subscription boxes, you’ll love this prize! Just click enter on the Rafflecopter below. You can also get extra entries for following me on Twitter, visiting my page on Facebook and subscribing to my post feed via email. This giveaway is only open to U.S. residents (sorry international readers–this would just be too heavy for me to ship).